The French court system demanded Doudet pay EUR 1500 for writing a negative review of Il Giardino one year ago. In the review (cached and translated) she wrote that the restaurant should be avoided and that the boss is a "diva." In early 2014, the restaurant manager brought Doudet to court. In court documents, the restaurant claims the review caused "great harm" because the negative review would come up as one of the first Google search results for the restaurant. The court asked Doudet to change the title of the post, which was "L'endroit à éviter au Cap-Ferret : Il Giardino" or "The Place to Avoid in Cap-Ferret : Il Giardino." She pulled the review instead. Along with the EUR 1500 fine, Doudet was also charged an additional EUR 1000 in court costs, making her grand total $3400. According to tech podcasts in my earbuds, this is the first example of an amateur, unpaid blogger having to pay damages for a negative review. It is a a growing problem around freedom of speech and only a matter of time before Ireland experiences this same scourge against free and open thinking. The courts--including the European Court of Justice, have more legal supports for privacy and one's good name than for the freedom of expression. We may have entered a world where critiques can only be positive or masked. I hope restaurants like Il Giardino are listening because the online world has started a backlash against the restaurant. I see this happening on TripAdvisor and Google+ in the form of steady one-star reviews. You can count this post as part of the backlash. Hillary Dixler -- "Food blogger fined $3400 for negative review" on Eater, July 17, 2014. 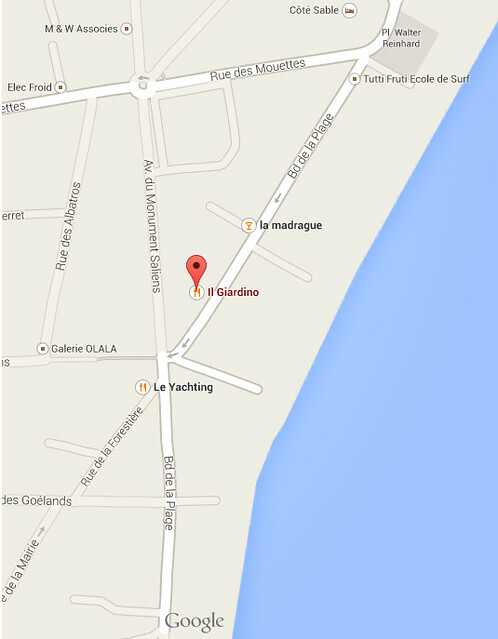 Il Giardino is currently #67 of 84 restaurants in Cap Ferret with 35 reviews on Trip Advisor.